The bonds between Ireland and Poland have strengthened since the economic boom and our participation at Euro 2012 certainly helped things along. With similar cultures, friendly people and a liking for excessive imbibing it is not surprising that occasions involving the two nations are generally fun affairs. But even that can’t explain why Poland are the team Ireland have played most frequently in friendly matches down through the years, a whopping 23 out of a total of 26 fixtures. The general consensus seems to be that that the FAI blazers in power in the 1970’s and 1980’s were acutely partial to Polish charms which lead to almost a dozen friendlies between the two countries. Of the 26 meetings Ireland have won just 6, drawn 10 and lost a further 10 so it’d be a nice shot in the arm if we evened things up a little for our upcoming trip to Warsaw. What follows is a short chronological walk through every game between the two sides with images and videos included where possible. The first meeting between Ireland and Poland was not a happy one for the Boys in Green as they were trounced 6-nil in Warsaw. Not even the mighty Johnny Carey of Manchester United could stem the goalfest which saw the Poles score 3 times in each half in front of 40,000 of their own fans. 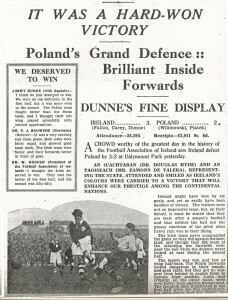 Thankfully there was a complete turnaround for the visit of the Poles to Dublin 6 months later. Goals from John Fallon, Jackie Carey, Jimmy Dunne ensured that the bumper Dalymount crowd of 34,000 witnessed the Boys in Green see off an opposition that had only 6 months previously destroyed them. The newspaper report included here gives some flavour of the importance of this win to the home fans. It would be a full 20 years before Ireland and Poland played each other again and the Irish came away with a commendable draw in Katawice. In nets for Ireland was Tommy Goodwin who had been part of the famous Irish team that had inflicted the first defeat for England on home soil at Goodison Park 9 years earlier. Both Irish goals on this occasion came from Noel Cantwell, one of which was a penalty. The return fixture in the Autumn of 1958 resulted in the same result and scoreline and to complete the near perfect symmetry both Irish goals were scored by Ireland captain Noel Cantwell, including one from the spot! In the build up to the qualifiers to the World Cup in England in 1996 Ireland sought to build confidence with a series of friendlies including 2 against Poland. Sadly the away leg was disappointing with Ireland comprehensively beaten in Krakow despite a goal form Paddy Ambroze. 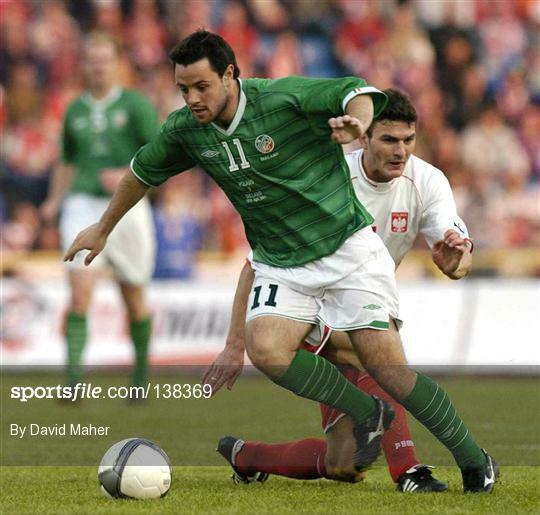 Thankfully Ireland had their beautiful revenge when Poland visited a packed Dalymount in the Autumn. The star of the show was undoubtedly a Blackburn player from Bray called Andy McEvoy who scored twice. And this in a season when McEvoy finished top goal scorer in England alongside Jimmy Greaves with an astonishing 29 goals. In what was a break from protocol Ireland instead hosted the first of the pair of friendlies with the return trip in Poland later in the year. And for much of this game it looked like Poland would run out comfortable victors until a pair of goals from John Dempsey and Waterford legend Alfie Hale in the second half secured a draw for the home side. The return leg in Katowice would be the start of a rotten run of results for Ireland against the Poles, with 4 straight defeats in a row. It was a grim period to live in Poland, behind the Iron Curtain but they were nonetheless capable of putting together an effective football team. 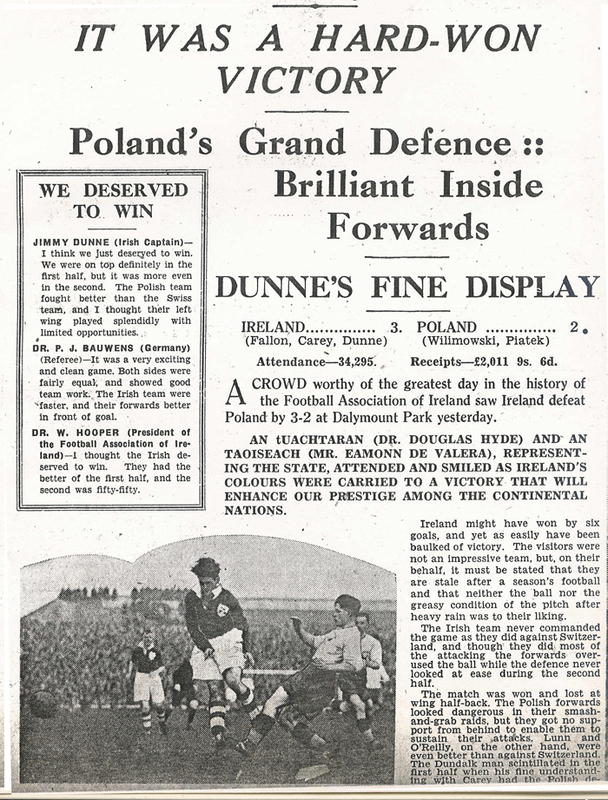 A late Don Givens goal in Poznan was not enough to see off Poland in Poznan before a crowd of 52,000. Things were even worse 4 months later when the Poles came away with a 2-goal victory in Phibsborough. The only bright moment came as Liverpool’s Steve Heighway made his debut. At this stage Ireland had caught the losing bug against Poland but they weren’t the only ones as England would find out to their own detriment later in 1973, when a gallant Polish side conspired to earn a draw at Wembley and be the first side to prevent the English from reaching a World Cup tournament. A goal in each half from Wlodzimierz Lubanski was enough to defeat the Irish in Wroclaw. This friendly was significant as it marked Johnny Giles’ first game in charge as Ireland manager and he did enough to end a run of 4 consecutive defeats against the Poles. Ireland’s goal came courtesy of Corkonian Miah Dennehy, his second in two games for Ireland, who was with Nottingham Forest at the time. An away Irish victory is always something to celebrate and with both of Don Givens goals coming in the first quarter of an hour this was a win without the usual dollops of squeaky bum time. A scoreless draw notable for the fact that it marked the Ireland debut of Mark Lawrenson. And the Dalymount crowd certainly got to see what he was made of as was moved around the park, spending time in defence and midfield in an attempt to see how he could be best utilised. 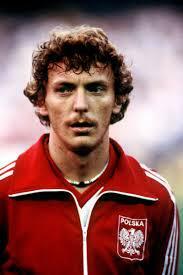 A crushing defeat for Ireland with one of Poland’s greatest ever players Zbigniew Boniek chipping in with a goal. 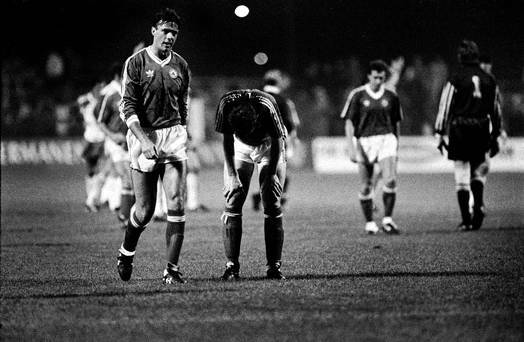 Packie Bonner was a little unlucky that his debut arrived against a rampant Poland who tore Ireland apart. The ominous signs were there from the off as the Poles scored within the first 90 seconds. To be fair the infrastructure in the Irish set up wasn’t as it should have been with the lads having to endure a 5-hour bus journey from hell to reach Bydgoszcs for the game. A nil-nil at Dalyer but at least it introduced the Irish fans to Mick McCarthy who had qualified to play for Ireland through his Irish father. Mick would go on to become Captain Fantastic and the 2002 World Cup side he managed played with plenty of passion and no little verve. By the mid 1980’s the home and away friendly cycle between Ireland and Poland had ground to a halt but the fixture still proved popular. This game was notable for being Jim Beglin’s last in a green shirt as a leg break would cruelly end his career with his country and his club Liverpool. It what would today be scoffed at as a paltry crowd of just 18,000 Ireland dispatched Poland before half-time with goals from Kevin Sheedy, Tony Cascarino and John Sheridan. What is even more surprising is that such an attendance should be recorded just a couple of weeks before the Boys in Green’s first tournament at Euro ’88. 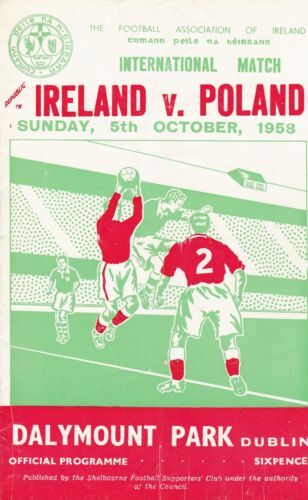 It would be over 50 years from the first Ireland/Poland game before the sides would meet in a qualifier. With Euro ’92 on the horizon it came as a surprise that an Irish team, led by Jack Charlton with the likes of Paul McGrath, Denis Irwin, Ray Houghton and John Aldridge did not prevail at home. The home qualifier may have been disappointing but nothing could prepare the Boys in Green for the disaster that would be the return leg in Poznan several months later. With victory in their grasp and qualification for Euro ’92 with it Ireland conspired to throw away a 2-goal lead while 3 – 1 up on their hosts with just a quarter of an hour to go. Yeah, it was up there with Macadonia in the disappointment stakes especially given that a win in this game would have meant we took England’s place at the tournament due to our superior goal difference. Brian Kerr oversaw a decent scoreless draw against Poland in what the first meeting of the two sides in 13 years. This was a unique occasion for a number of reasons, not least because it was taking place in the home of the GAA but also because it appeared as if there were more Poles in the stadium than Irish. The game was a good one, for a friendly anyway, with Poland taking a 2 goal lead before Ireland mustered the inevitable fightback that feel just short. Stephen Hunt and Keith Andrews scored the Irish goals in a game which marked Giovanni Trapattoni’s first defeat as Ireland manager. A goal in each half from Ciaran Clark and Wes Hoolahan was enough to silence the huge Polish contingent at the Aviva Stadium. It truth it was a slightly fortuitous win for the Boys in Green as the menacing Robert Lewandowski was unlucky not to score on several occasions but any 2-goal margin of victory for Ireland is something to cherish. In what was only Martin O’Neill’s second game in charge Ireland showed commendable grit to withstand a late Polish onslaught at the death, themselves trying to prove themselves in front of new manager Adam Nawalka. A good performance from Ireland and while Shane Long’s goal arrived late it would have been a grave injustice if Poland had left the Aviva stadium with full points. But draws at home aren’t what you need when trying to qualify for a major tournament so while there was some relief for the Irish fans the overall sense was that of disappointment.